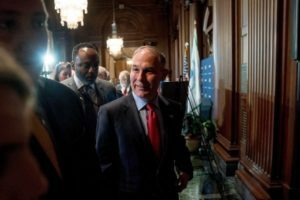 Can we all agree, despite verbal support from Mr. Trump, it sure looks like EPA chief Scott Pruitt has made some powerful enemies, who want him fired from his post? Can we all agree, Facebook can make some changes, but it will never be able to satisfy critics since it’s business plan is based on selling our personal data? Can we all agree, China has the upper hand in any trade war with the US since they don’t have to worry about elections, public opinion and a stock market crash? Can we all agree, the trade war with China will hurt Trump voters the most? Can we all agree, Sinclair Broadcasting’s insistence that ‘must run’ segments sent to their stations are ‘non-political,’ doesn’t pass the smell test? Can we all agree, it doesn’t look like the GOP tax cuts will be giving the Republicans much of a boost as long as Mr. Trump’s approval rating remains at record lows? Can we all agree, even Wisconsin Governor Scott Walker seems worried that a blue wave will sweep the country this November? Can we all agree, putting the National Guard on the border with Mexico, just underlines the fact that the immigration service cannot find enough people to patrol the border? Can we all agree, bringing a loaded gun to a meeting with constituents is just asking for trouble, especially if you are a Congressman? Can we all agree, it wasn’t a good week for former world leaders: ex-presidents in Brazil and South Korea are facing long jail sentences? Can we all agree, Russian oligarchs sanctioned by the US have probably already figured out a way around the new regulations? Can we all agree, even Trump supporters don’t believe that he didn’t know about the settlement his attorney set up with Stormy Daniels? Can we all agree, anyone planning to visit a National Park should celebrate the government’s decision not to substantially increase entrance fees? Can we all agree, after reading the terms of his settlements of the sexual harassment complaints, it’s pretty clear former Fox TV host Bill O’Reilly is just a disgusting human being? Can we all agree, Kentucky taxpayers have every right to be upset that lawmakers hiked taxes on almost 95% of the state’s residents, but gave the richest 5% a tax break? Can we all agree, Mr. Trump’s head-scratching reversal on Syria, is just one more example of the chaotic state of US foreign policy? Can we all agree, supporting US businesses used to be the President’s job, but it appears no one told Mr. Trump? Can we all agree, despite reports to the contrary, no one believes The President isn’t the main focus of Special Counsel Robert Mueller’s investigation? Can we all agree, imposing quotas on immigration judges, might speed up processing, but it will probably leave justice as roadkill? Can we all agree, most of us would be pretty happy with an offer of a single college scholarship – getting 20 is pretty remarkable? Can we all agree, inviting Vladimir Putin to the White House, while you are being investigated for colluding with the Russians, defies all political logic? Can we all agree, there will be more teacher walkouts across the country? How the SF Ballet gave one young girl from Puerto Rico a chance to achieve her dreams.